The delay in passing and implementing the 2018 farm bill has left hemp producers and state departments of agriculture dealing with a world of uncertainty regarding everything from importing seed to providing guidance to law enforcement about how to regulate the transportation of hemp across state lines. The Federal Communications Commission plans to invest about $20.4 billion in rural broadband infrastructure, a move the agency says will add high-speed internet service in about four million homes and businesses. David Bernhardt, who has served in a variety of senior positions in the Interior Department, was confirmed as secretary by the Senate on Thursday, a victory for cattle producers, energy companies and other interests who see him as an ally on public land management and endangered species regulation. Agriculture Secretary Sonny Perdue, Bayer and crop protection groups are criticizing a decision by Vietnam to ban the use of glyphosate in the country, a growing market for U.S. farm goods. A California Senate bill calling for a complete ban on the broad-spectrum pesticide chlorpyrifos passed the Health committee yesterday by a vote of 5-1, with three members abstaining, and will now be heard in the committee for Environmental Quality. The National Pork Producers Council has cancelled its signature summer event out of an “abundance of caution” as African Swine Fever continues to rip through the global pork herd. In the past 25 years, our world has cut hunger, poverty, and malnutrition in half and lifted a billion people out of poverty. We are on the cusp of a critical leap forward in agriculture related to data. This advancement will provide critical information to farmers who are working continuously to produce more using fewer resources. Improved data analysis will also help us extract meaning from data already being collected but not being utilized to its fullest potential. We know many on-farm practices are benefiting the environment, and this data could help verify them. 2019 Ag & Food Policy Summit: What's the future for beginning farmers? 2019 Ag & Food Policy Summit: What's the future for conventional proteins? The Tax Cuts and Jobs Act (TCJA), enacted in December 2017, eliminates or modifies many itemized deductions and tax credits, while lowering Federal income tax bracket rates on individual and business income. Had the TCJA been in place in 2016, family farm households would have faced an estimated average effective tax rate of 13.9 percent, compared to the actual 17.2 percent effective tax rate that year. Had the TCJA also been in effect in 2017, the average effective tax rate would have been 12.8 percent, more than a percentage point lower than had it been in effect in 2016. By comparison, the actual effective tax rate in 2017 was 16.8 percent. The estimates vary by farm size. For example, small family farms would experience the lowest average effective tax rates, at 11.5 percent in 2016 and 10.4 percent in 2017. Only midsized family farms would have experienced an increase in their average tax rate, from 14.7 percent in 2016 to 15.8 percent in 2017. Those rates are still below the actual tax rates midsized farms experienced: 20.5 percent in 2016 and 20.8 percent in 2017. 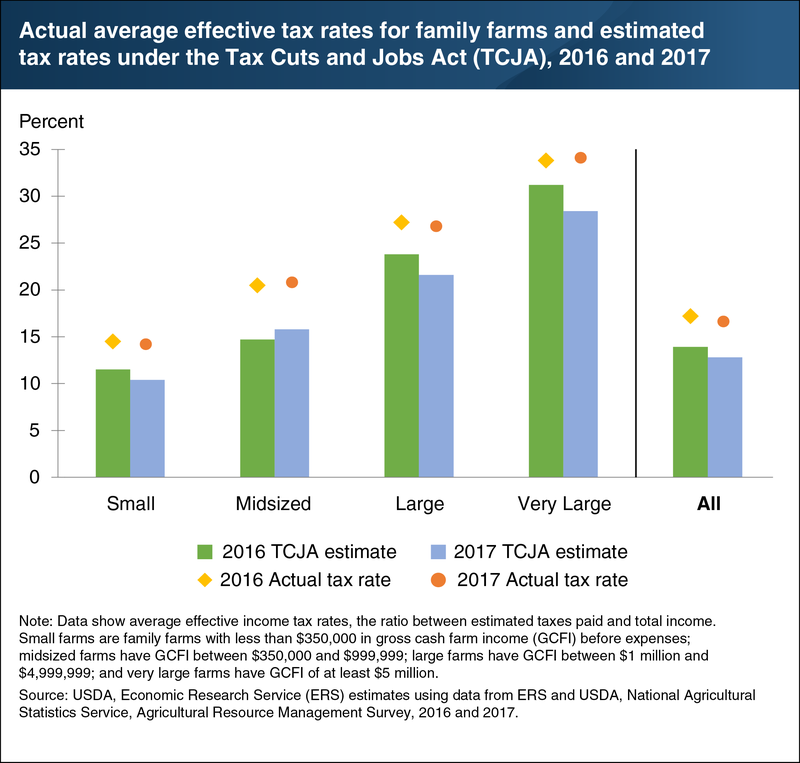 This chart updates data found in the June 2018 ERS report, Estimated Effects of the Tax Cuts and Jobs Act on Farms and Farm Households. For more on this topic, see “The Tax Cuts and Jobs Act Would Have Lowered Average Income Tax Rates for Farm Households between 2016 and 2017” in the April 2019 edition of Amber Waves. Meet the Lawmaker: Rep. Abigail Spanberger, D-Va.
Rep. Abigail Spanberger serves Virginia’s 7th District which produces a wide variety of agriculture products ranging from row-crops, dairy, bison and vineyards. This freshman congresswoman and ex-CIA officer heads the House Agriculture Committee’s Subcommittee on Conservation and Forestry.